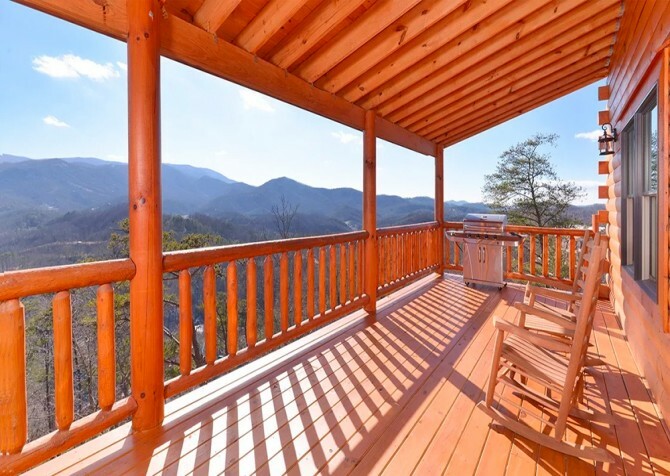 Relax and reconnect with nature in Treetop Tranquility, a uniquely designed, pet-friendly cabin featuring wooded views with the Great Smoky Mountains peeking through. 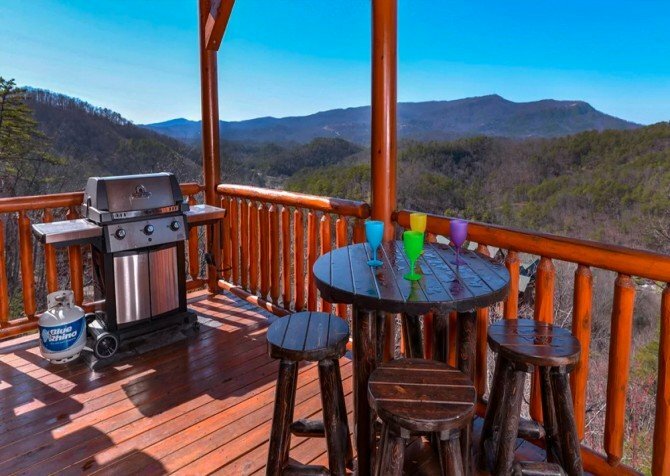 Sleeping up to 13 people, this 4-bedroom, 4-bathroom Pigeon Forge cabin provides a large open floor plan for everyone’s comfort, a rec room to put your air hockey skills to the test, and an outdoor space fantastic for an evening barbecue that ends in a hot tub soak. With these amenities and more, a stay in Treetop Tranquility is a stay you won’t forget! When you’re not spending time around the cabin, explore downtown Pigeon Forge for its unique shops, family-friendly attractions, and restaurants. From outlet shops to art galleries, go kart tracks to wineries, candy stores to steakhouses, there is truly something for everyone. 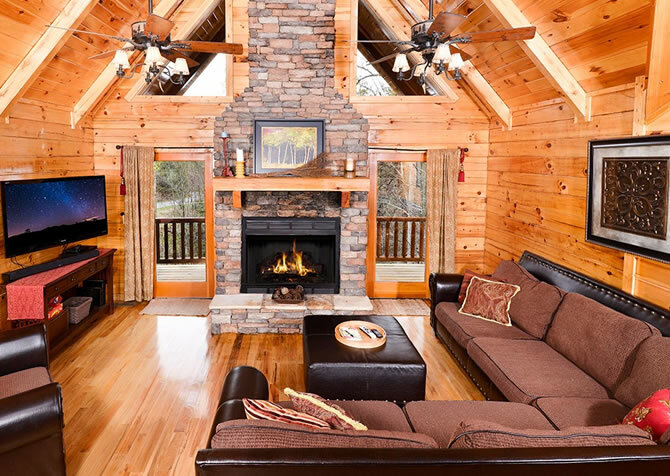 You can spend days pampering yourself, challenging yourself in the Great Smoky Mountains National Park, or just relaxing back at the cabin with cozy spaces, games, and peaceful wooded views. Inviting in the earth and the sky through large windows running from floor to ceiling, the living room features 3 couches (2 are queen sleepers), an electric fireplace bordered by stone, and a mounted big screen TV. While the grownups chill on the sofas for some conversation and coffee, let the kids wrestle on the large area rug in the center — where you can keep an eye on their friendly matches. Cuddle up with one of the 3 bear throws as you settle in for the latest release of your favorite show. Come in and warm yourself by the fire after some quiet time with nature on the deck outside. 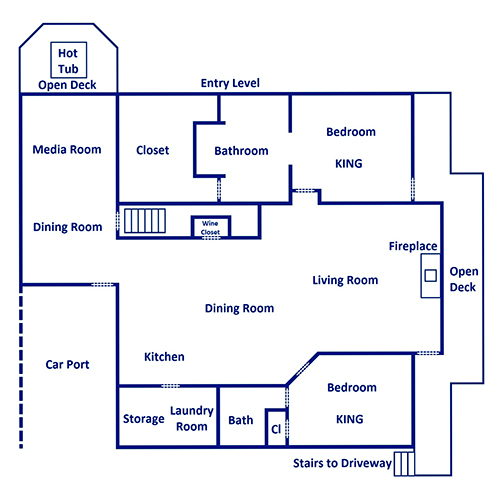 Truly, this living space was made for families and friends alike. Potentially the most important space in the home, the kitchen is quite large with a butler’s pantry — home to a large sink, a trash compactor, a dishwasher, a microwave, and tons of extra counter space! In the main kitchen area, there is a porcelain double sink (with a cute bear cutout overhead), a refrigerator, a stove, a toaster, a blender, and — never to be forgotten — a coffeemaker. With a large island in the middle, unloading groceries will be a breeze. Plus, this kitchen is fully equipped with dishware, pots and pans, silverware, and more, so your grandma’s secret recipe doesn’t have to wait until your return. With scenic views streaming in from the living room windows, you’ll be happy to put your mad cooking skills to use in this kitchen! During the holidays or on game days, set up a delicious buffet for everyone to snack on throughout the day. Right off the kitchen, the dining area is ready for any meal you can toss at it. The elegant wooden table is accompanied by 8 matching chairs with cushioned seats to keep you comfy while you dine. With a nice chandelier above and natural light pouring in from the living room windows, the dining area can also double as a game space. Bring your favorite board games – or check out the collection in the rec room – and get ready for a fun night! Not up for cooking? Have a meal catered by in-cabin chefs at Savory Solutions by Chef Jeremy or grab some pizza or takeout. Prepare yourself for a fun night in the rec room with board games, awesome movies, puzzles, and more! Take a seat on the double recliner (with drink holders!) and pop a classic comedy in the DVD player for movie night on the flatscreen TV. Hone your skills as an air hockey athlete or buy all of America’s national gems in Monopoly: National Parks Edition. 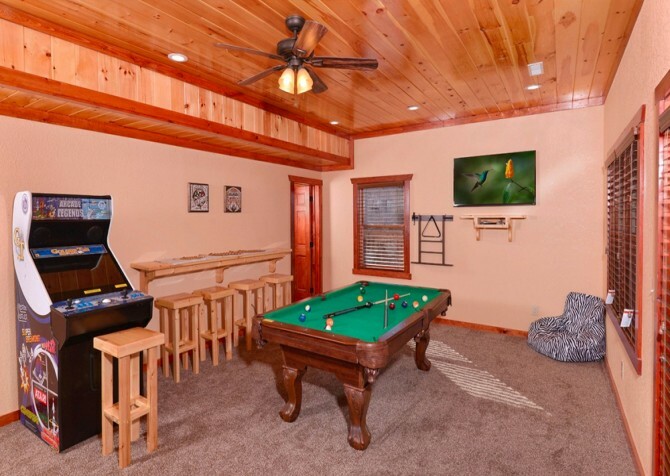 With games and puzzles in the TV stand and a table with 4 cushioned chairs, this room is ready to play when you are. If high-tech gaming is more your style, power up the Wii and show your friends who’s boss! After you’ve jumped, kicked, punched, and danced to your heart’s content, chill out for a bit under the cooling ceiling fan on the comfy couch. Also, this room is carpeted, so when your enemies fall to their defeat, it won’t hurt so bad…on the outside. With 4 unique bedrooms to choose from — each with its own flatscreen TV — it may be difficult to decide who sleeps where. First off is the spacious master bedroom, featuring a king-size bed, a nice view overlooking the tree tops, and a large open master bathroom — with an antique-style vanity and a stone entryway to the shower! There is also another bedroom with a treetop view and a king-size bed on the same level. Next is a bedroom with a kitchenette (to keep all your treasured treats safe! 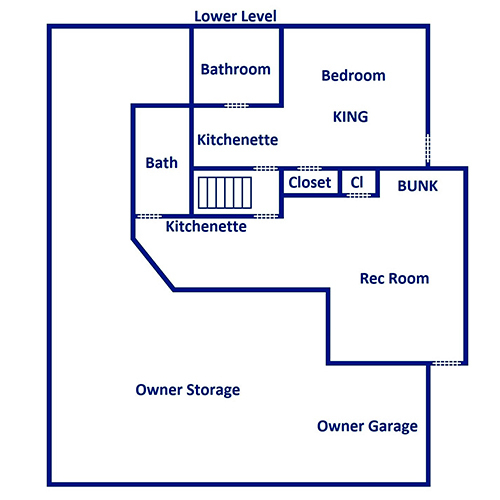 ), access to the front porch, a closet supporting a full-length mirror, a king-size bed, and an en-suite bath. Coming in last — but certainly not least — is a bedroom with a bunk bed (a twin-size bed on the top and a full-size bed on the bottom), a pool table, and a wet bar. Leave the door open for others to grab a drink, or keep it closed to have them all to yourself! At the very least, it will be handy to stay hydrated during a rambunctious round of pool. As you pull up to the steep, paved driveway, you’ll notice 2 parking areas with enough space for 3-4 vehicles. A few stepping stones lead to a cozy front porch with 2 chairs, perfect for taking a rest after a day of Pigeon Forge adventures. Located right off the living room, the deck has a few chairs with cushions and a side table for your morning coffee. Head out to the green space for a barbecue party — complete with a hot tub, charcoal grill, 6 chairs, and 3 side tables. As you soak away your troubles in the hot tub outside, keep an eye on the kids inside while they play games in the rec room. Being pet-friendly, your pup is more than welcome at this cabin! Imagine him chewing his favorite toy on the large area rug (good for traction!) in the living room or trying to compete with the kids on the Wii — precious! Also, you’ll find a convenient washer and dryer in the kitchen’s side room — all that counter space is excellent for folding laundry. Don’t forget to keep up with your friends on social media with the cabin’s free Wi-Fi! About 10 minutes from Pigeon Forge, Treetop Tranquility helps you escape from the city yet be close enough to enjoy its perks. If you’re in the mood to explore a creepy mansion with frightening actors spooking you at every chance, check out Ripley’s Haunted Adventure and get your scream on! Go out for some southern comfort food at The Old Mill Pottery House Café & Grill. There’s even a small pond you can view from an outside table so you don’t have to leave the serenity of nature. Spend an entire day at The Island. With a great Ferris wheel, fine restaurants, and tons of shops, this fun, unique place has everything you need for a fun-filled day! "“Treetop Tranquillity” We only had a short two night stay but enjoyed it very much and loved the location."